The discovery of a 4,000-year-old wine cellar in Israel has provided the best direct evidence yet of the raucous, boozy celebrations that were a key part of the region’s culture at the time. 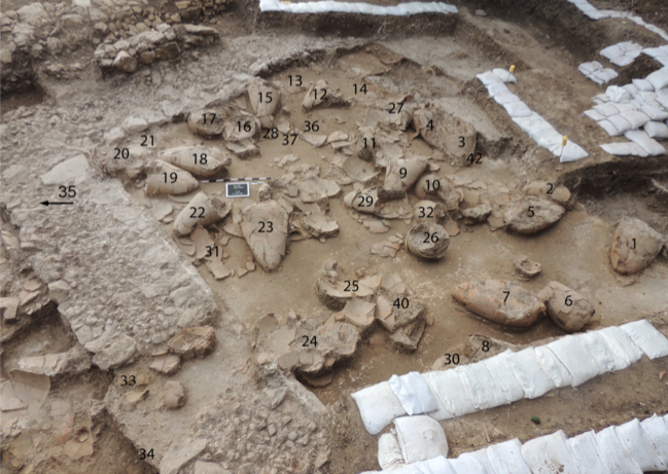 The cellar was found during a recent excavation at Tel Kabri, Israel, described in a new paper in the journal PLoS ONE. In the remains of a palatial storage complex, archaeologists uncovered ceramic jars and fragments of other vessels dating from the Middle Bronze Age, a period which ran from roughly 1900 BC to 1600 BC. Analysis of ceramic samples showed the presence of tartaric and syringic acids, which are standard wine identifiers in archaeological contexts. Tests also revealed various combinations of herbal additives such as honey, juniper, mint, myrtle, and cinnamon. Wine was an essential part of Bronze Age life in Canaan (as well as the larger Levantine area) – the region roughly corresponding to modern day Israel-Palestine. This is partly due to the fertile soil and warm climate, which made the area ideal for vines to thrive. The abundance of grapes and therefore wine explains its significance and presence in a variety of events. The test results match with what we know from historical sources such as a list of wine types and additives from Mari, Northern Mesopotamia, in 18th century BC, or the Ebers Papyrus from Egpyt. Dating from 1550 BC, the Ebers Papyrus was a predominantly medical text, and included such prescriptions as a remedy involving powdered dung mixed with wine and administered orally. What remains of the Tel Kabri wine cellar today. Koh et al. The vessels were found in a storeroom off the main hall at Tel Kabri, and could have held 2,000 litres of wine. Though this seems like a sizeable stockpile, it could have been consumed fairly quickly and must have been replenished every season. Wine is known to have a longer shelf life than other alcoholic beverages (such as beer) in the Bronze Age, but even a large cellar such as this wouldn’t have lasted forever. So how could one court get through around 3,000 modern day wine bottles in one year? Large feasts involving the ritual consumption of alcohol are one reason. In the Levant, such celebrations were known as marzeah, involving an elite cadre of well-heeled people, generally men, who threw parties characterised by heavy wine drinking. Marzeahs could be held to venerate a god (though they were not directly religious), remember a deceased ancestor, to celebrate hunting, warfare, or a certain rite of passage. The alcohol consumption was key, especially wine. The reasons for such excess are unclear: perhaps to commune with the gods, to demonstrate their own form of divine qualities, or simply social drunkenness among men in a scene reminiscent of an ancient fraternity party. The overall concept of the marzeah was likely one that affirmed social status and hierarchy. The celebrations included young, nubile girls; at one point even two unmarried daughters of the god El attended a marzeah (they were apparently drunk and badly behaved, but the surviving texts make no mention of sexual activity). Overall the evidence on women’s role is mixed. Excluded wives had their own marzeahs, or similar events, but some sources note that men and women did drink together, both under watchful eyes and at weddings. Wine was also used in religious contexts, where it was often used as an offering to the gods, or in wakes where mourners played music and drank wine. In festivals, it used in sacrificial rituals or mythological battle re-enactments, where wine often took the place of blood. Wine served as thanksgiving and a symbol of the payment system, which was essential in the economic system. It was so commonplace in the Levant that it was included in lodging rations, and possibly used to pay tithes, as one would with grain. Even the army were sometimes paid in wine. But it is the big parties that are most relevant to this newly discovered cellar. Ultimately what was going on here was conspicuous over-consumption of an essentially unproductive/luxury commodity – wine. Thorstein Veblen, an early analyst of such indulgence among the upper classes, once described this as lending a “means of reputability to the gentleman of leisure”. Veblen was writing in 1899 about capitalist society, but his point was such consumption at the top was a hangover from feudalism and before. The finding at Tel Kabri is a case in point – who needs 3,000 litres of wine? By using wine in this way, the elite of the Bronze Age were signifying and justifying their power. Karlena Tomc-Barbosa, PhD candidate in Archaeology at Durham University, is affiliated with The Explorer's Club.